I hate to cook. Period. I have mageirocophobia,the cook's equivalent of stage fright. Just knowing that someone else is going to consume and judge what I am cooking turns me into a quivering pile of Knox gelatin. Then why do I own shelf after shelf of cookbooks? To me, cookbooks are literature. My favorites are the organizational fundraisers, each contributor adding a little history. ("My mama always made this milk punch for Christmas brunch" or "Uncle George used to stir up this stew on hunting trips.") Family tales aside, each recipe really is a potential story. The ingredients form a cast of characters waiting for the right circumstances...a specific way of combining, a certain degree of heat...to become something delicious and memorable. Thank goodness my husband does cook. For someone who doesn't cook, food and recipes are an integral part of most of my books. I have my mother to thank. I fear cooking. Mom hated it. I remember finishing lunch at the kitchen table, while Mom went into meltdown mode over supper, five hours away. With her head inside the ice-encrusted maw of our non-self-defrosting refrigerator freezer, Mom shuffled through frozen bricks of meat and vegetables, muttering "What can I make for supper?" Finally, she would extract a couple of frost-covered, foil-wrapped bricks and with an exhausted sigh, toss them on the countertop to defrost. Mom had sentenced herself to making yet another meal. Eventually I learned the source of Mom's distaste. During the Depression, my mother's mother (known as Maga to her grandchildren) ran a boarding house as a way of keeping food on the table for her family of eight. (If this sounds like a certain fictional character from the American Girl series...well, sorry. It's the truth!) My teen-aged mom served as Maga's sou chef, in cooking vast quantities of food, not only for her own family, but for a dozen or so boarders. That meant a hot breakfast, a hot supper, and a packed lunch for everybody. No wonder Mom hated cooking. This also explained why all of Mom's recipes read"Yield 24". "Frances, are you cooking for the Fifth Army?" Dad would ask, peering into an enormous vat or skillet or roaster pan. "You can reduce the recipes." "Too much trouble," Mom would shrug. I understood. Cooking was bad enough without adding a math exercise to the mix. Even though Mom was only cooking for three people, the food didn't go to waste. If we had hash on Monday (a good meat-stretching Depression era meal), we also had it Tuesday, Wednesday and Thursday. When I moved out on my own, Mom didn't offer me a file of heirloom recipes, and I didn't ask. I never wanted to eat Fried Salmon Patties or Scrapple again. In fact, I didn't even think of those old boarding house recipes until I was writing Jimmy's Stars. It suddenly dawned on my that Maga was running a boarding house through the World War II rationing. Sure, her boarders ration stamps helped out, but sometimes it didn't matter if you had the money and the stamps. The food just wasn't available. It was being sent to "the fighting boys overseas." Aha! This explained Maga's "meat" loaf where the main ingredient was a soy "meat extender." And Wacky Cake, made without eggs, flour of sugar. Even my all-least-favorite-dish-ever, stewed tomatoes. I dug deeper into a world where sugar, butter and meat were scarce. Recipes emphasized "natural sweeteners" (like prune juice), "sweetbreads" (which are neither sweet nor bread) and "the lesser organ meats." I wondered what the average American kid thought of finding a "tongue" sandwich in his lunchbag. I decided that in matters of school lunches, the kids' tastes haven't changed that much over time. The difference would come in that the kid of 1943 had come to realize that patriotism and sacrifice took precedence over personal preference. 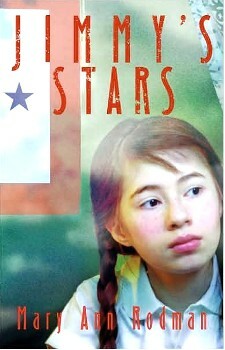 Food became integral to Jimmy's Stars because finding and preparing food was such a large part of WWII homefront life. "Use it up, wear it out or make do" inspired "Rookie Cookies" (butterless, rock-like lumps that could withstand the trip from homefront to battlefront) and "Tomato Aspic." I had so much fun researching additional recipes, never thinking that bloggers and teachers would ask for them, and actually make them! 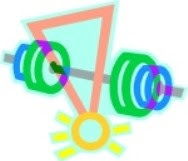 Check out the results at Mawbooks. 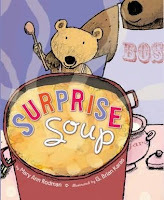 My latest picture book, Surprise Soup, came from my husband and I swapping childhood food memories, both involving our fathers. Considered too young to "sit still" in church, Craig and his father stayed home Sunday mornings, making pancakes for the return of the rest of the family. My dad was (and still is!) an excellent chef. He pitched in with mealmaking when he could, but as an FBI agent, he didn't have a lot of time to indulge his inner Emeril. My favorite memories are of weekends when we would make Dad's vegetable beef soup, a process that could consume an entire Saturday. I sliced and diced these two memories, chopped them together, added and subtracted ingredients and fiddled with the heat. After several years of simmering on the back burner of my mind...voila! Surprise Soup! True, I can't really make soup or aspic or even the allegedly goof-proof Wacky Cake without scorching or botching something. But in my mental kitchen, there is always a pot of soup bubbling on the stove, a batch of cookies in the oven, and a loaf of home-made bread, rising under a clean dish towel. And sometimes, when I am lucky, my husband who is a good cook, brings my food fantasies to fruition. Try this with your young writers. Write down your favorite food, whatever it might be. Now describe this food, without telling how it looks. Here are some questions to consider: How does it taste? Is it sweet, salty, sour, a combination? Can you taste individual ingredients? How does it feel in your mouth? Crisp, crunchy, smooth, slippery, hot, cold? What does it smell like? Does one ingredient dominate the aroma? Do you have any specific memories of this food? Where did you eat it first? Does it remind you of any place or time or person? The last time I used this exercise, my entire group of middle schoolers, except one, all described the same dish...macaroni and cheese! Yet, no two descriptions were alike, because everyone had their own personal vision....from mac-in-a-box to Grandma's-from-scratch! Usually I don't recommend books per se. I just tell you what I am reading. But what I am reading now fits in so well with our current topic, I just had to tell you a little about it. It is The Food of a Younger Land: A Portrait of American Food--Before the National Highway System, Before Chain Restaurants, and Before Frozen Food, When the Nation's Food Was Seasonal by Mark Kurlansky. The WPA Writer's Project was compiling an encyclopedia of American food when World War II essentially ended the work. Kurlansky has compiled some of the never-published essays into this fascinating book. Some of the contributors' names are familiar...Zora Neale Hurston, Nelson Algren, Eudora Welty...and some are not. All transport us back to a time when local food meant just that. Happy reading and Bon Appetit! I love how you've woven bits of your family history (and recipes) into your fiction. Thanks so much for sharing. I was just thinking about food. I spent a lot of time this weekend in the kitchen with various members of my family. We made polenta, potstickers, and pizza. We cooked a pumpkin (getting ready for Thursday's pie), roasted two eggplants, made several bowls of salad, and a HUGE batch of chocolate chip cookies. This morning I cooked the beans that will go in tonight's soup. We are definitely into food and cooking. Each of my boys is supposed to be responsible for a meal this week (because they are off of school). It'll be interesting to see what they come up with. I will keep your book suggestion. It sounds wonderful. I also like the writing exercise. I am so relieved that someone else is frighted of cooking. It doesn't mean I don't cook...it just means I am always wondering if it's okay enough...!